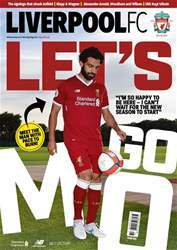 Don't miss the latest issue of Liverpool FC's official monthly magazine. Inside we profile new signing Mohamed Salah, the front-runner who will give the Reds another exciting attacking option. We also hear what the Egyptian ace had to say after putting pen to paper, while columnist Neil Mellor runs the rule over the gifted ex-Roma forward. We also speak exclusively to three young guns aiming to build on first-team debuts in 2016/17. Trent Alexander-Arnold, Ben Woodburn and Harry Wilson reflect on their progress to date and outline their hopes for the future. In another exclusive, we hear from David Wagner, manager of newly-promoted Huddersfield Town, who lifts the lid on his close friendship with Reds manager Jürgen Klopp. Elsewhere, centre-back Joel Matip explains why he is looking for improvement on a personal and collective basis when the new season kicks off. Five Liverpool Ladies players are off to EURO 2017 in the Netherlands this month and we chat to Shanice van de Sanden (Netherlands), Caroline Weir (Scotland) plus Casey Stoney, Alex Greenwood and Siobhan Chamberlain (England) outline their hopes for success. After Dirk Kuyt announced his retirement recently, we reflect on his time at Anfield and look back at a dozen of his most memorable goals. Remember when Liverpool defeated PSV Eindhoven to lift the Champions League trophy following the Miracle of Istanbul? Of course not. But as we look back at the Reds' cup final history in their 125 year history, we ponder what might have been had the other semi-finals taken a different turn. With all this and much, much more, why not treat yourself to the latest issue of the official magazine? It's essential reading for every Red.